Swimming pools are nice and all, but nothing beats swimming in wild waters, be they rivers, springs, or oceans. Whether you bathe for ritual purposes, for exercise, for the fun of it, or because it’s so trendy some call it “the new yoga,” wild swimming is best enjoyed in clear water where you can see the marine life and the rock formations below you. There are many bodies of crystal-clear water in the US, but we selected the nine most beautiful to encourage you to take a plunge in the great outdoors as soon as the sun is out. 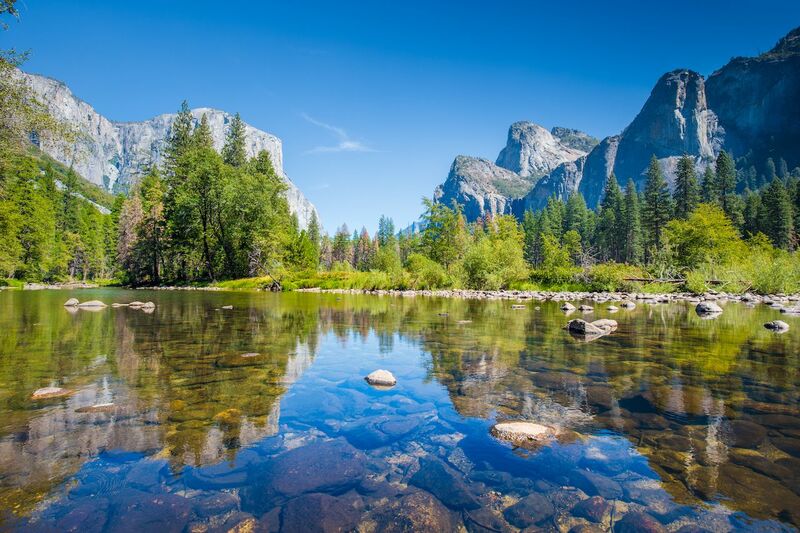 Yosemite is one of the few national parks to allow swimming in most waterways. It’s easy to enjoy the Merced River, which is popular not only for taking a dip but for kayakers and rafters, too. A mellow spot on the Merced is at El Capitan Meadow, with waters so calm you can float. Another popular swimming location is the alpine Tenaya Lake, on Highway 120 between Yosemite Valley and Tuolumne Meadows. As with every wilderness swimming location, it’s important to follow the park’s safety rules and to keep the sites pristine by respecting environmental regulations. 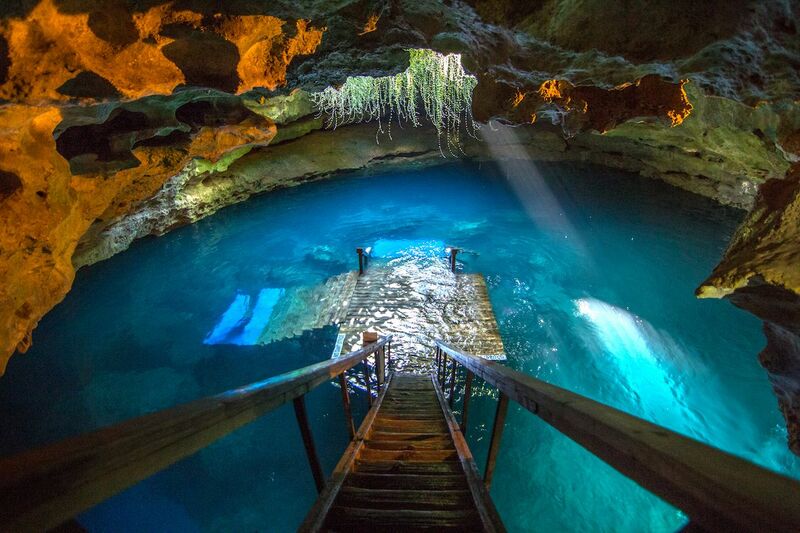 Devil’s Den — a 50-foot-deep sinkhole near Gainesville — is a unique place to take a dip. Subterranean snorkeling and scuba diving experiences are key here; general swimming is actually not allowed if you don’t have a mask. Due to the cave conditions, the clear water is always a perfect 72 degrees. As the temperate water evaporates into the ambient air, it emits steam which likely inspired the cave system’s name. Snorkeling and scuba gear are available to rent. Neither crocodiles or alligators reside in Devil’s Den, just a few fishes and a turtle named Nelson. There are, however, ancient rock formations, 33-million-year-old fossil beds, and stalactites. Vermont’s Mad River has some of New England’s most accessible swimming holes. 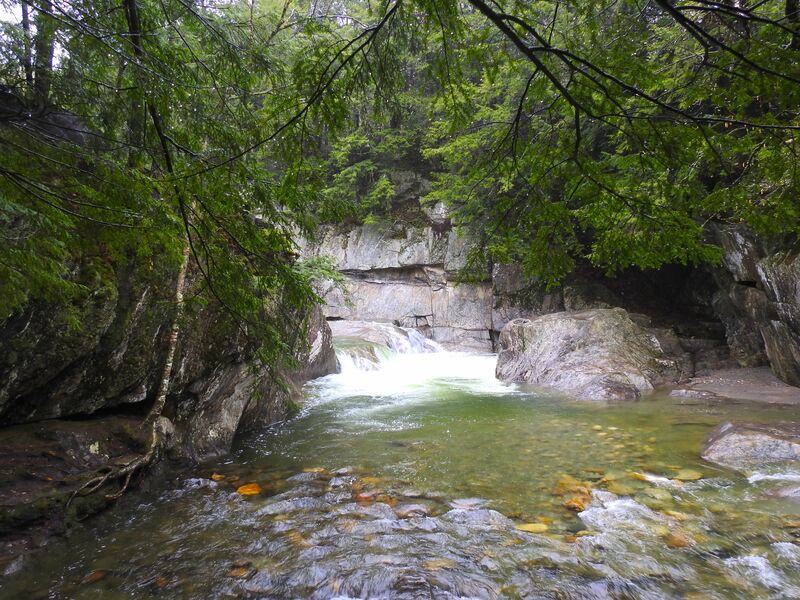 In the Green Mountain National Forest, Warren Falls is a fan favorite, with two pretty, medium-sized, waterfalls crashing into the pristine, if frigid, rock-enclosed pool at the bottom. The water in the swimming area ranges from turquoise to clear emerald, depending on the season’s vegetation. It’s a safe and welcoming place to swim, though the cliff divers jumping from the top of the falls might give pause. Because it’s so idyllic, it gets busy on weekends, but it’s well worth the voyage — and you can bring dogs. 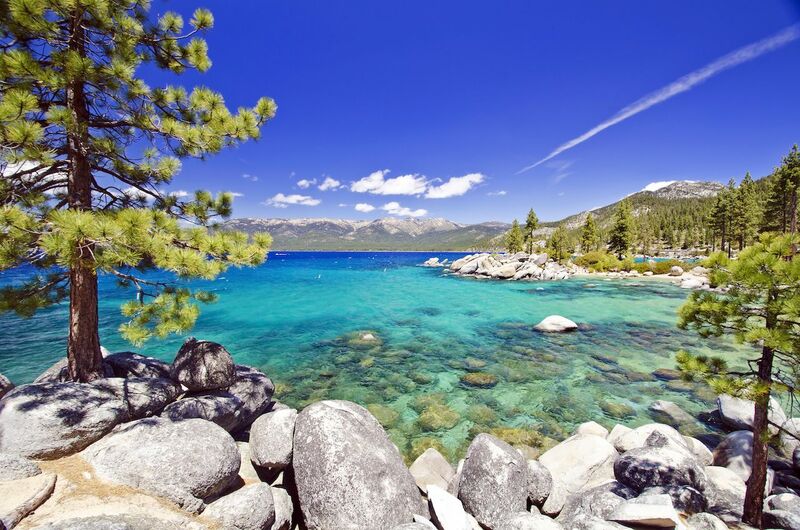 Lake Tahoe straddles the border between California and Nevada. It’s a giant lake that’s also extraordinarily deep; in fact, it’s the second deepest lake in the US after Crater Lake in Oregon. That means the water is cold. It also has a long shoreline with diverse beaches ranging from sandy to rocky. Sand Harbor on the north shore in Lake Tahoe Nevada State Park is a favorite for swimming (as well as boating and fishing). The beach is sandy and slopes gently, allowing for easy entry into the crisp, clear blue water. There are also some interestingly shaped boulders that people like to jump from. 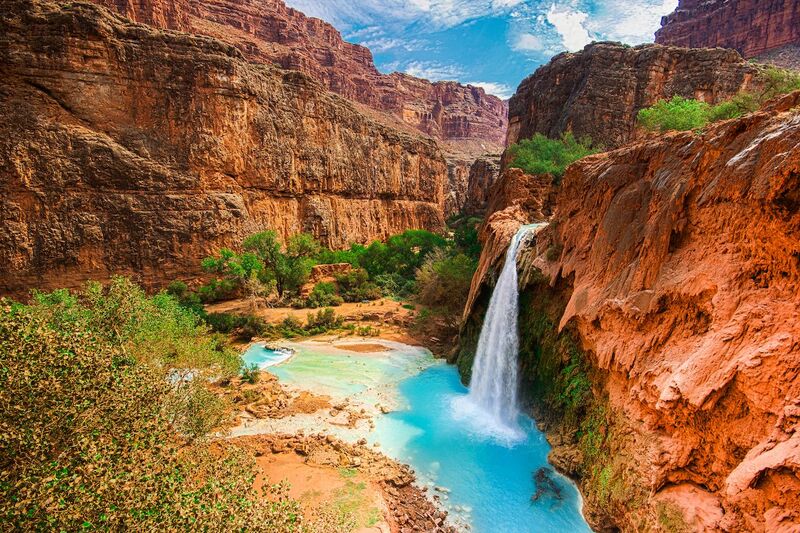 At the bottom of the Grand Canyon, on a part of the usually muddy brown Colorado River, is Havasupai Falls. After what feels like a million miles of hiking, a series of waterfalls crashes into some of the bluest water you’ll ever see. The most famous of the falls is Havasu Falls, which drops 98 feet over the orange travertine canyon walls to form a clear aqua swimming hole. This part of the Grand Canyon is tribal land, and the Havasupai people who live there regulate visitation to the falls and their nearby Supai Village. You need a permit to camp as there is a minimum stay length, and the permits are pretty hard to get. They’re issued via an online National Park Service lottery beginning on or around February 1 every year. The permits are not cheap, either — rates are about $150 per night, per person. But this is a trip of a lifetime: to swim under the falls is awe-inspiring and unforgettable. Set in the Ozarks’ St. Francois Mountains, Missourians love to visit Johnson’s Shut-Ins State Park to swim in the enclosed pools on the East Fork Black River. The shut-ins, named because the river is literally shut in by igneous erosion-resistant rock, which renders the pools crystal clear. Some of the pools are placid while others foment to the point of emulating urban water park-type chutes and wave pools. A warm-water shelter for vulnerable manatees, Three Sisters Springs in Crystal River National Wildlife Refuge is appropriately named. The water is so clear that you can see the bottom of the spring from the boardwalk. From April 1 to November 14, swimming in the springs is unrestricted. During manatee season, November 15 to March 31, the springs are often closed to swimmers to protect the manatees from human contact. 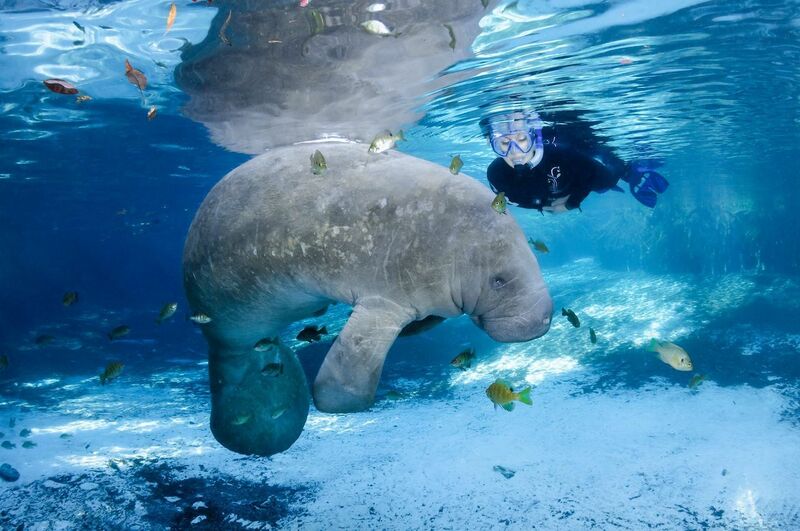 However, you can swim with manatees in the springs’ adjacent canal, and there are plenty of tour operators that take snorkelers, divers, swimmers, and wildlife lovers to interact with the animals outside the refuge. 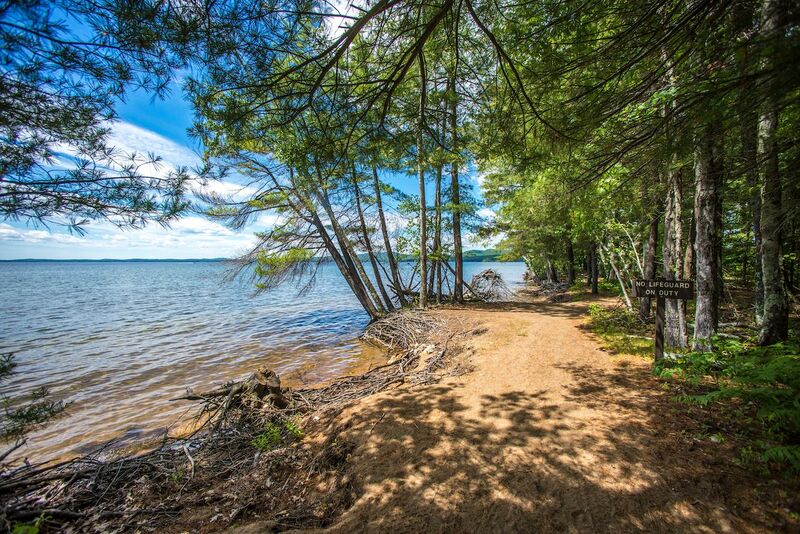 Sebago Lake State Park, located at the foothills of Maine’s White Mountains, was one of the nation’s five earliest designated state parks. The park’s 45-square-mile lake fills an ancient granite basin fed by Ice Age glacier runoff. Most of the beaches are almost white, fine-grain sand. One of the more popular beaches for families is Songo River Beach at the lake’s north shore. In addition to swimming and other water recreation, you can camp, cross-country ski and snowshoe, hike, and bike. Swimming is seasonal due to the water’s freezing winter temperatures, but ice forms later on this lake than on those nearby. The park is open year-round and there’s a small fee to get in. Once upon a time, the Hawaiian royalty used this stunning ocean bay for recreation and fishing. 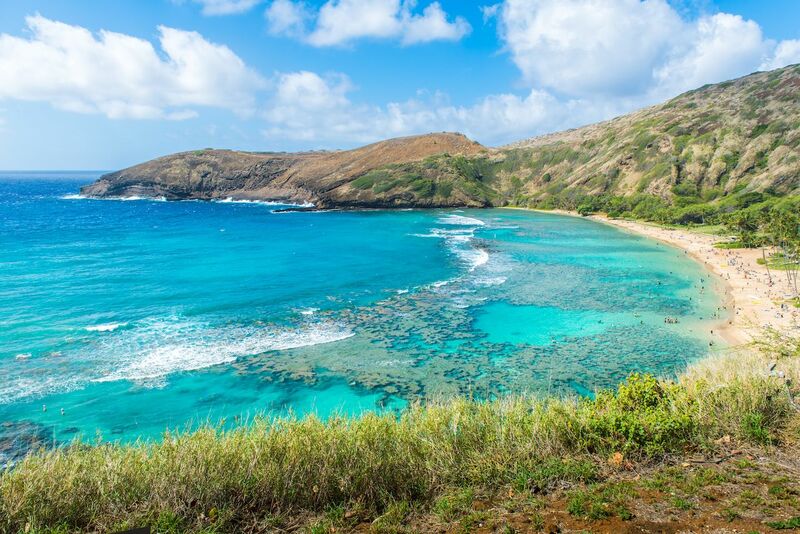 Today, Hanauma Bay State Park is an area dedicated to the conservation of marine wildlife such as tropical fish and rare corals. Still, you can swim, snorkel, and dive with spinner dolphins and sea turtles who call the bay home. Multiple companies offer tours to the park, usually including a shuttle there and back to developed areas, but these don’t include the $7.50 park admission fee. Be aware that the park is closed on Tuesdays — a weekly chance for quiet during the deluge of visitors.